Papers of ICISDM2017 are indexed by Ei Compendex and Scopus! Authors are invited to submit abstract/papers through the Electronic Submission System before February 1, 2019. Welcome Assoc. Prof. Pardeep Kumar, Sterling Ramroach, Sanjay Tyagi and Suliman Almasoud join in Technical Committees! 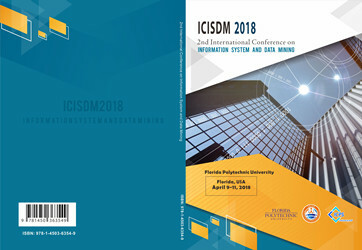 Recently, we have received a few complaints from authors who get scammed by the fake ICISDM conference. After our deep investigation, we found the website has fake information written all over it, from the conference photos and the publications. Clearly, it’s completely a fraud. ICISDM is organized by South Asia Institute of Science and Engineering (SAISE), to avoid future confusion, we’d like to make a statement here: The fake ICISDM conference has nothing to do with SAISE, nor does SAISE know any information about who is responsible for this. But SAISE has started investigation and will take this very seriously. SAISE reserves the rights to take legal actions to the shameless fraudsters. In the meanwhile, we suggest the authors should identify the authenticity of the conference carefully first before submission. And please don’t hesitate to report any questionable conference to us so that we could gather the evidence and act promptly, to let more people avoid being victims of fraud.